Taken by ESA’s Rosetta Spacecraft, this new image of comet 67P/Churyumov-Gerasimenko shows the diversity of surface structures on the comet’s nucleus. The image was taken by the Rosetta spacecraft’s OSIRIS narrow-angle camera on August 7, 2014. At the time, the spacecraft was 65 miles (104 kilometers) away from the 2.5-mile-wide (4-kilometer) nucleus. 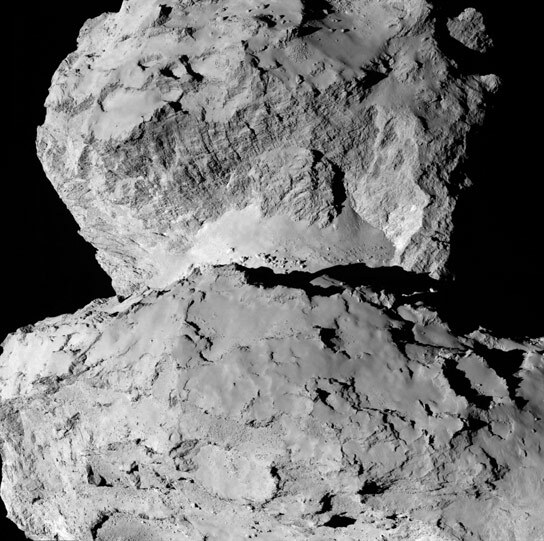 In the image, the comet’s head (in the top half of the image) exhibits parallel linear features that resemble cliffs, and its neck displays scattered boulders on a relatively smooth, slumping surface. In comparison, the comet’s body (lower half of the image) seems to exhibit a multi-variable terrain with peaks and valleys, and both smooth and rough topographic features. Launched in March 2004, Rosetta was reactivated in January 2014 after a record 957 days in hibernation. Composed of an orbiter and lander, Rosetta’s objectives are to study comet 67P/Churyumov-Gerasimenko up close in unprecedented detail, prepare for landing a probe on the comet’s nucleus in November, and track its changes as it sweeps past the sun. Comets are time capsules containing primitive material left over from the epoch when the sun and its planets formed. Rosetta’s lander will obtain the first images taken from a comet’s surface and will provide the first analysis of a comet’s composition by drilling into the surface. Rosetta also will be the first spacecraft to witness at close proximity how a comet changes as it is subjected to the increasing intensity of the sun’s radiation. Observations will help scientists learn more about the origin and evolution of our solar system, and the role comets may have played in seeding Earth with water. Rosetta is an ESA mission with contributions from its member states and NASA. Rosetta’s Philae lander is provided by a consortium led by the German Aerospace Center, Cologne; Max Planck Institute for Solar System Research, Gottingen; French National Space Agency, Paris; and the Italian Space Agency, Rome. JPL, a division of the California Institute of Technology, Pasadena, manages the U.S. participation in the Rosetta mission for NASA’s Science Mission Directorate in Washington. Be the first to comment on "New Rosetta Image of 67P/Churyumov-Gerasimenko"